With our mandate of boosting agricultural development in the district, we recognise that supporting agricultural-related education can go a long way to bolstering this process by paving the way for those desiring a future in farming. The common thread then between the agricultural projects is that the initiative has come from the aspiring farmers themselves, with the more established farmers providing skills, guidance and financial support where necessary. These examples of knowledge sharing, mentorship and support across the bounds of colour and creed speak to the potential that can be realised through the joining of hands and the turning of soil in the Harry Gwala District. In May 2017, HGA began engaging with the Esayidi TVET College in Umzimkhulu in an effort to establish an in-service training programme for their students undertaking a national diploma in farm management. This course involves 18 months of theory after which candidates are required to complete 18 months of experiential learning in order to obtain their diplomas. At the time there was no system in place to offer this opportunity nor any funding available to support the students whilst undergoing their training. This campus alone enrols upwards of 100 students for this course every semester and so there was a terrific need for assistance. The provision of funding from Pannar Seed for 20 students for the duration of their training was a significant milestone in this endeavour. HGA then went about interviewing students to identify those with a real passion for a future in farming and then finding commercial farmers willing to offer these students the opportunity to complete their diplomas. Thanks to their support, all 20 students have now been placed and HGA is working hard to streamline the programme in order to build on it in the future and get more qualified individuals out into the agricultural workspace. When one of the staff members on Mr Douglas Strachan’s farm asked for help with her garden plot in Mazabekweni, a neighbouring community near Highflats, a new project was born. An initial demonstration open to the community focused on agroecological cultivation techniques for small gardens, and since then the project has been rolled out in roughly 50 households in Mazabekweni, even expanding to neighbouring villages as news of the successes spread. The residents of Mazabekweni have boosted their food security, enjoy the satisfaction of putting home-grown food on the table, and are benefitting from reduced reliance on purchased goods. The community share a hammermill which they use at a fee to convert their home-grown maize to mealie meal. The funds generated go into a stokvel and are then used to subsidise input required by local farmers. The sound governance of profits yielded means that the project remains autonomous and any setbacks are dealt with promptly. 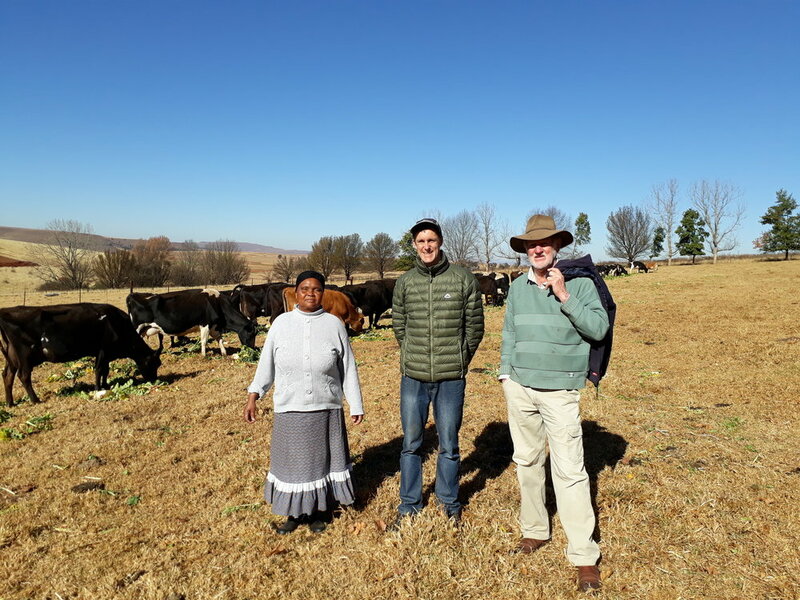 Mr. Strachan is now using the same approach to help communities residing on the farm he grew up on in the Umzimkulu area which was incorporated into the Transkei in the 1980s. When the Celokuhle Timber Dairy Farm Trust acquired land near Swartberg ten years ago, the District Land Reform Committee stipulated that a mentor was required for the trust to receive financial support. They elicited the help of a local commercial farmer, Mr. Robert Willliamson, who has now been acting as a mentor for five years. The trust grows timber, is currently milking between 80 and 100 cows, has 239 head of beef cattle and has obtained support from the Agribusiness Development Agency to assist with the development of a new dairy and installation of a pivot. In a similar fashion, Mr. Rob Stapylton-Smith, vice-chairperson of HGA and a successful dairy farmer from Eastwolds near Donnybrook, has been mentoring his neighbour, Mr. Ducky Ngcobo, for ten years. Having traded in his taxi business for agriculture, Mr. Ngcobo is now milking 150 cows. Significant changes are being made on his 120 hectare farm as road infrastructure is put in place along with fenced camps for rotational grazing and a water reticulation system. More recently, HGA was approached by Mr. Cyril Hlengwa from Hlutankungu near Highflats needing assistance with an irrigation scheme to boost his vegetable production. HGA arranged the design of the irrigation scheme and gathered support from Omnia, Sutherland Seedlings and Farmers Agricare to help cover the costs of the scheme. Following that, Mr. Andrew Pooler, a local commercial farmer, agreed to mentor Mr. Hlengwa to ensure the full potential of the investment to the farm is realised. If you'd like to support one of our existing projects, suggest a project, or start your own, please contact us to chat further.